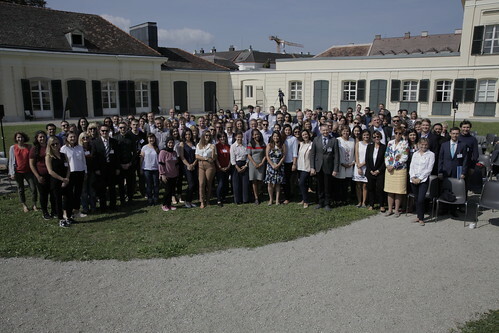 A total of 75 researchers and policymakers from 40 EU Member States and neighborhood countries attended the Evidence and Policy Summer School co-organized by IIASA and the European Commission’s Joint Research Centre (JRC) in collaboration with the International Network for Government Science Advice and the Global Young Academy. The event, which ran from 5 to 7 September, was held under the auspices of the Austrian Presidency of the Council of the European Union, with the support of the Austrian Ministry for Education, Science, and Research, and the Austrian Ministry for Europe, Integration, and Foreign Affairs. Chair of the IIASA Council, Michael Clegg, welcomed participants on Wednesday together with IIASA Acting Director General Nebojsa Nakicenovic, who emphasized that we live in times where evidence is more abundant and more important, but also more contested than ever before. This is why, continued Nakicenovic, one of the aims of the Summer School is to train both scientists and policymakers in enhancing the uptake of scientific evidence in policymaking and in societal debate more generally. Director-General of the JRC Vladimír Šucha, in his opening remarks also explained how crucial it is for science and policy to work together for the benefit of society. He also emphasized the importance of universities and other research institutions in providing policymakers with relevant and correct information in an era marked by an unprecedented amount of data, scientific controversies, and post fact politics that often make it difficult to know what the facts are. Once the Summer School had been officially opened, participants had the opportunity to listen to a video address on “Population and migration as a policy challenge” by Federal Minister for Education, Science and Research of the Republic of Austria, Heinz Faßmann. Faßmann pointed out that although collaboration between policymakers and researchers is not always easy because of the vast differences between the two disciplines, it should be fostered as it could have fruitful consequences. He continued that research and innovation play an increasingly important role in solving global challenges and that current policy challenges could create windows of opportunity for researchers and policymakers alike. Minister Faßmann’s address was followed by a keynote lecture by IIASA World Population Program Director Wolfgang Lutz, who talked about “Population and migration as a policy challenge” after which the participants made their way to the Paradise Garden for a performance by a group of artists and scientists. The piece titled “Migraspectives – A dance theatre game”, tackled the current debate on migration through the lenses of diverse and often conflicting worldviews. The afternoon session kicked off with a panel discussion on population and migration in the EU neighborhood where participants had the benefit of hearing the thoughts of speakers working at the forefront of the science-policy interface. After this highly informative discussion, participants engaged in a role-play exercise where they had to make policy decisions against the background of changing demographics. The exercise was followed by a discussion in the Paradise Garden, during which participants could reflect on the dos and don’ts of policymaking based on what they had experienced during the role-play.